All cells are able to sense and respond to substances present in their external environments. For example, motile bacteria will move toward a source of sugar but away from a toxic chemical such as phenol. Cells are not only able to sense chemical substances in their environments, but also such things as heat and cold. Sudden exposure to elevated temperatures results in the synthesis of a set of proteins that protect the cell from heat damage. The ability to respond to external stimuli enhances a cell's chance of survival, but in addition, especially in multicellular organisms, responding to external stimuli can be part of a cell's moment-to-moment function. For example, nerve impulses are transmitted through the body by the action of extracellular signaling molecules called neurotransmitters . Insulin, a hormone circulating in the bloodstream, promotes the absorption of sugar into a variety of cell types. Neurotransmitters and hormones are two important examples of extracellular signaling molecules released by one cell to influence another. 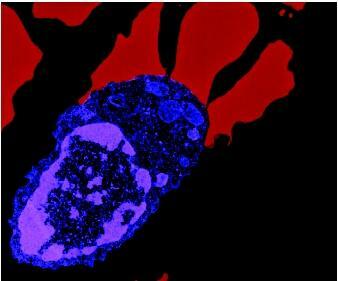 A scanning electron micrograph of lymphocytes (T cells) and three red blood cells. Responding to external stimuli (in the case of lymphocytes, to infectious agents) can be part of a cell's moment-to-moment function. binding of a signaling molecule to its receptor activates the receptor, setting off a chain of events, much like a row of falling dominoes, called a signal transduction cascade. Activation of the receptor transmits the signal (but not the signaling molecule) to the first in a series of enzymes inside the cell, which in turn activates others, until the ultimate enzyme (or enzymes) is reached that causes the final response. The different kinds of signal transduction pathways that exist are discussed below, followed by a more detailed description of a few of those that are the best understood, and that are ubiquitous throughout the animal kingdom. The different signaling pathways in multicellular organisms are often divided into three categories: endocrine , paracrine, and autocrine signaling. In endocrine signaling, a signaling molecule, called a hormone, acts on a cell located at a distance from where it was synthesized. An example of this is stimulation of glucose uptake by insulin. Insulin is a hormone produced by the β cells in the pancreas and is secreted into the bloodstream, from where it can act on many different cells, even those located far from the pancreas. Paracrine signaling refers to signaling between neighboring cells. Paracrine signaling is common during development, where a cell's fate is determined by interactions with its neighbors. In addition, the passing of nerve impulses between nerve cells is an example of paracrine signaling: neurotransmitters secreted by a nerve cell into a synapse (the space between two nerve cells) bind receptors located on the neighboring nerve cell, thus transmitting an impulse. In autocrine signaling, a cell responds to stimulants it produces. An example of this occurs during the immune response. The T cells of the immune system help destroy harmful invaders, and upon detecting their presence they produce and secrete growth factors to which they themselves respond. The result is an increase in their numbers, and an ensuing increase in the magnitude of the defensive response. Whether a cell responds to a signal, and how it responds, is determined by the set of receptors it has and the transduction pathways it has in place when it receives the signal. Much of the development is based on using these differences in receptors and pathways. The kinds of signaling molecules that exist are almost as varied as the types of proteins that exist in an organism. As would be expected, many are proteins, but many, such as neurotransmitters and steroid hormones , are nonprotein molecules, and still others, such as nitrous oxide and carbon monoxide, are gaseous. The types of receptors to which they bind are varied in structure and possess a variety of enzymatic activities, however, they are all protein in nature. The three signaling pathways described below may seem overly complex. Why not have much simpler relay systems, say, involving just a cell surface receptor spanning the plasma membrane and a direct effector , such as a metabolic enzyme or a transcription factor ? The answer may lie in the flexibility that such complex pathways afford. Having many different components in a pathway gives the cell many points at which to stimulate or inhibit the pathway, or the opportunity to use the components in different ways (see the mating pathway in yeast, for example). In addition, the relay system allows for amplification of the signal at each step. Thus, for example, the binding of a single molecule to a cell surface receptor may activate one hundred G-proteins, each of which may then activate one hundred kinase molecules and so on. Thanks to this type of amplification the cell can be made sensitive to even very low concentrations of extracellular stimulants. Also, each of these pathways has been shaped over millions, or perhaps billions, of years of evolution. The features and functions of each pathway have been modified many times during evolution, with new levels of control added on top of older systems. The result is not necessarily the most efficient (although it may be in some cases), but it was what worked and was chosen by natural selection. Upon anticipation of muscular activity, such as when a fearsome predator appears in one's vicinity, the hormone epinephrine (also called adrenaline), is released into the bloodstream by the adrenal medulla. At the surface of its target cells (muscle cells, and to a lesser extent, liver cells) it binds to a receptor called the β-adrenergic receptor. The β-adrenergic receptor spans the plasma membrane. The intracellular portion of the receptor is bound to a member of the G-protein class of proteins. In the absence of epinephrine, the G-protein is bound by GDP and is inactive, but binding of the hormone to its receptor induces the exchange of GDP for GTP. Stimulation of glucose production by epinephrine. Through a series of steps, this activates an enzyme located in the plasma membrane called adenylate cyclase. Adenylate cyclase converts adenosine triphosphate ( ATP ), a ubiquitous molecule in the cell, into cyclic AMP (cAMP). cAMP is called a second messenger because it mediates the effects of the first messenger, the original inducer, which in this case is epinephrine. cAMP then activates an enzyme called protein kinase A (PKA), which activates another enzyme that stimulates the breakdown of glycogen into glucose, the cell's primary energy source. Stimulated by a different enzyme, PKA acts to inhibit the incorporation of glucose into glycogen, which is the cell's energy storage molecule. Thus, by this two-pronged approach, PKA keeps the cell's usable pool of energy at a maximum during epinephrine stimulation. The yeast S. cerevisiae can be one of two mating types, called a and α, and when the two mating types encounter one another they can mate (or fuse), and subsequently give rise to offspring. Each mating type secretes its own mating factor (or mating pheromone ), a small molecule that can be detected by receptors on the surface of cells of the opposite mating type. When an a cell detects α-factor in its vicinity, a variety of physiological changes occur (such as growth toward the cell) that prepare it to undergo mating. The α-factor receptor, like the β-adrenergic receptor described previously, is coupled to a trimeric G-protein. In this case, however, the next member of the pathway is a kinase called Ste20 (for ste rile 20 ). Ste20 then stimulates a Map kinase ( m itogen a ctivated p rotein kinase) cascade, which is a group of three kinases that are activated sequentially. Each of the three kinases in the cascade of the mating pathway phosphorylates the next. Finally, the last one phosphorylates and thereby activates a transcription factor called Ste12, which activates a set of genes whose products prepare the cell for mating. A fourth protein, called Ste5, plays a critical role in the activation of the Map kinase pathway, yet it possesses no known enzymatic activity. It is thought to serve as a scaffold, binding all three kinases and keeping them in close proximity, thus maximizing the efficiency of the chain reaction. This kind of scaffolding molecule has been found in other pathways as well, and may turn out to be a common mechanism for keeping signaling pathways rapid and specific. An interesting aside to the mating pathway is that a second pathway, called the filamentous growth pathway, uses some of the same components as the mating pathway. The filamentous growth pathway is stimulated by nitrogen starvation and is characterized by morphologic changes very different from those observed during mating. 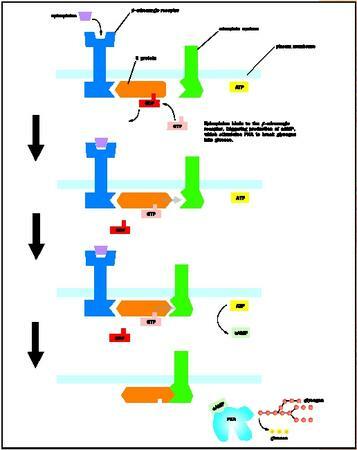 Two of the same three kinases (plus Ste5) are required for filamentous growth; however, a different Map kinase called Kss1 substitutes for the last member of the pathway. Both pathways converge on Ste12, which is the ultimate recipient of the signal in both cases. If the last domino is the same in both cases, how do the different responses come about? The answer is complex and is still being deciphered; however, part of the solution appears to lie in the ability of Ste12 to associate with different partners. Ste12 functions as a dimer and, depending on the identity of its partner, will activate a different set of genes. Thus, low nitrogen levels promote the association of Ste12 with one partner (and activation of a specific set of genes), while mating factor promotes association with another partner (and activation of another set of genes). Further experimentation is needed for a more complete understanding of this enigma. A third ubiquitous eukaryotic pathway is the phosphoinositide pathway. Its activation signals many different processes including cell proliferation, hormone secretion , smooth muscle contraction, and transduction of visual information. A key enzyme in the pathway is called phospholipase C (PLC), which cleaves PIP 2 (phosphatidyl inositol 4,5 bisphosphate), a minor phospholipid component of the plasma membrane, into IP 3 (inositol 1,4,5 trisphosphate) and DAG (diacylglycerol), as represented by PIP 2 PLC* IP 3 + DAG. Receptor stimulation results in the release of both IP 3 and DAG, each of which then goes on to elicit a separate cellular response. IP 3 is a small hydrophilic molecule that diffuses into the cytoplasm and binds its receptor, located in the membrane of the endoplasmic reticulum (ER). This stimulates the release of calcium from the ER into the cytoplasm, increasing the cytoplasmic concentration approximately tenfold. Calcium binds a small molecule called calmodulin, through which it exerts most of its effects. One of these is stimulation of a kinase called calcium/calmodulin kinase II (CaM kinase II), which phosphorylates many different target proteins, such as ion channels, metabolic enzymes, and transcription factors. Meanwhile, DAG, which remains bound to the cytoplasmic side of the plasma membrane, binds and activates a kinase called protein kinase C (PKC), which exists in many different forms in the cell. Interestingly, calcium also stimulates the activity of some forms of PKC, and thus these forms of the enzyme integrate signals from both arms of the phosphoinositide pathway. PKC activates many different pathways in the cell including a Map kinase pathway (see above) that leads to cell proliferation. In addition, it activates the transcription factor NF-κB by phosphorylating its inhibitor, IκB, thus targeting it for degradation. Changeux, J. P. "Chemical Signaling in the Brain." Scientific American 269, no. 3 (1993): 58–62. Cooper, Geoffrey. "Cell Signaling." In The Cell: A Molecular Approach. Sunderland, MA: Sinauer Associates, Inc., 1997. Gibbs, W. W., S. Nemecek, and G. Stix. "The 1998 Nobel Prizes in Science." Scientific American 280, no. 1. (1999): 16–19. Epinephrine release is part of the "fight or flight" response. Map kinase cascades are extremely common in animal cells and are involved in many different processes, including cell proliferation in mammalian cells (hence their name), development in fruit flies and nematodes, and programmed cell death in fruit flies and mammalian cells.